With regard to the several beneficial effects mentioned for Mumiju, we hypothesized that the administration of this substance can be effective in the improvement of gastric ulcer. Therefore, the aim of this study was to investigate the gastroprotective effects of this substance by measuring gastric acid and pepsin levels. Male Wistar rats (200-250 g) obtained from the animal room of the Kerman University of Medical Sciences. They were kept in a temperature-controlled environment on a 12:12 h light/dark cycle with free access to food and water. The procedures were in accordance with the guidelines for the care and use of laboratory animal of Kerman University Medical Science (IAEC No. : 01/027/04). This experimental study was carried out on 40 male Wister rats to study therapeutic effects of Mumijo extract on acetic acid-induced gastric ulcer. Animals were randomly (n = 10 in each group) divided into four groups: (I) Control received normal saline (2 ml/kg), (II) sham-operated group received 0.2 ml of acetic acid to induce gastric ulcer, (III) Mumijo (100 mg/kg/daily) was given for 4 days postacetic acid administration, (IV) ranitidine group received the standard drug, ranitidine (20mg/kg), dissolved in normal saline. Twenty-four hours before each experiment, animals were deprived of food, but free to drink water. Mumiju was prepared from the local residents of Sardoiyeh in Jiroft/Kerman/Iran. Then it was recognized by botanist from Botanical Survey of Kerman, Iran. Immediately, it was washed thoroughly with running tap water and cut into small pieces. Then the plant material was shade dried at temperature 21-24°C and ground mechanically into a coarse powder and stored in an airtight container. Powdered plant material (150 g) was macerated with 400 ml of distilled water at 21-24°C temperature for 3 days with frequent shaking. After 3 days, the extracts were filtered and to the marc part 300 ml of the solvent was added and allowed to stand for next 2 days at same temperature for second time maceration (re-maceration) and after two days, again filtered similarly. The combined filtrates (macerates) were evaporated in vacuo at 40°C and the dry extract obtained was stored in a vacuum desiccator for future use. All the test samples were administered by oral lavage in a volume of 1 ml/100 g body weight once a day to each rat . This study protocol was approved by the Ethics Review Committee, Kerman University of Medical Sciences, Kerman, Iran. The results were expressed as mean ± standard error of mean, and statistical significance was evaluated using one-way ANOVA, followed by a Tukey's post-hoc test. Significance of difference was accepted as P < 0.05.
pH data are shown in [Figure 1]. The pH was 3.43 ± 0.32 and 3.93 ± 0.54, respectively, in sham and ranitidine-treated animals and this difference was not significant. However, when the extract was administered to the acid acetic-treated group, there was a significant increase in pH of gastric contents to 4.54 ± 0.78 (P < 0.01). 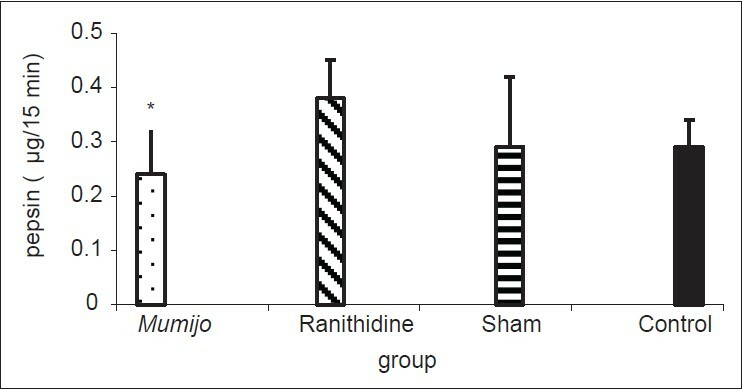 Gastric pepsin levels in Mumijo group were significantly lower than ranitidine group (P < 0.05). 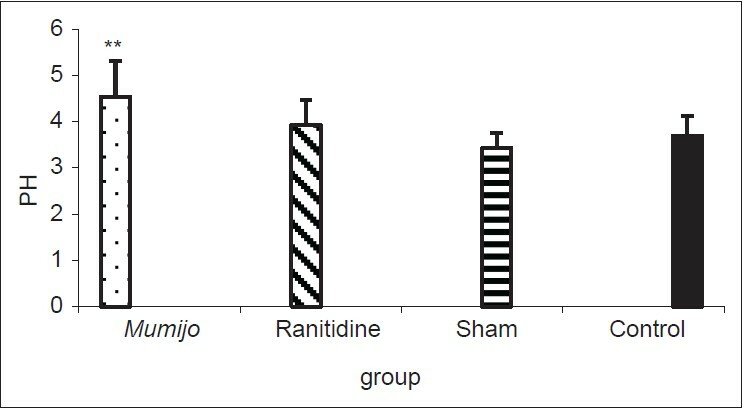 However, there was no difference between ranitidine or sham groups compared to control [Figure 2]. Acid acetic caused histopathological lesions including ulcer with transmural necrosis and degeneration of the gastric tissue. Treatment with Mumijo extract offered significant protection against all damages to mucosa by acid acetic [Figure 3]. Gastric ulcers are due to inequality between aggressive (acid-pepsin secretion, Helicobacter pylori, bile, increased free radicals, and decreased antioxidants) and defensive factors (mucus, bicarbonate secretion, prostaglandins, blood flow and the process of restitution, and regeneration after cellular injury) of the gastric mucosa. ,, In the present study, it was recognized that the Mumijo had protective effects against the gastric ulcer induced by acetic acid. Protective effects of Mumijo on the stomach may be related to its anti-secretary action as our results showed that the Mumijo reduced the amount of gastric acidity and pepsin levels in the damaged stomach. Overall, the results of the present study showed that Mumijo administration has gastroprotective effects in acetic acid-induced ulcers through decreasing gastric acid and pepsin. Furthermore, the antioxidant and anti-inflammatory effects of this extract can be mentioned as probable mechanisms to improve gastric tissues. However, further studies are required to determine other functional mechanisms of Mumijo. The present study was financially supported by the Neuroscience Research Center of Kerman University of Medical Sciences, Kerman, Iran. Akhtar MS, Akhtar AH, Khan MA. Antiulcerogenic effects of Ocimum basilicum extracts, volatile oils and flavonoid glycosides in albino rats. Int J Pharmacognosy 1992;30:97-104. Goel RK, Bhattacharya SK. Gastroduodenal mucosal defence and mucosal protective agents. Indian J Exp Biol 1991;29:701-14. 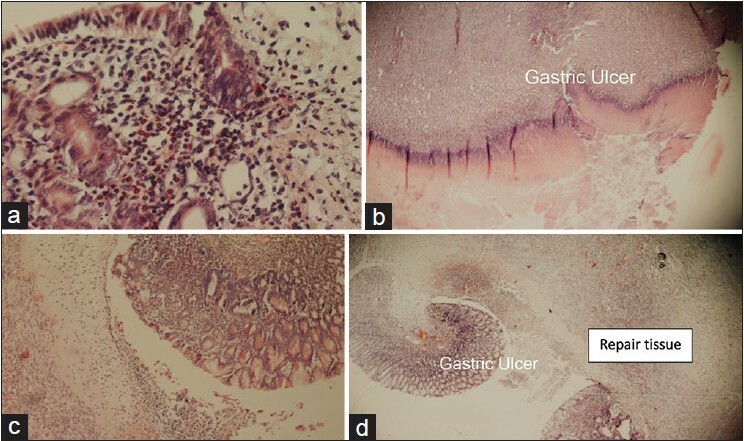 Laine L, Takeuchi K, Tarnawski A. Gastric mucosal defense and cytoprotection: Bench to bedside. Gastroenterology 2008;135:41-60. Ghannadi A, Zolfaghari B, Shamashian S. Necessity, importance and applications of traditional medicine in different ethnic. J Tradit Med Islam 2011;13:161-76. Ghosal SK, Kumar Y, Srivastava R, Goel RK, Dey R, Bhattacharya SK. Anti-ulcerogenic activity of fulvic acids and 4'-methoxy-6-carbomethoxybiphenyl isolated from shilajit. Phytother Res 1988;2:187-91. Goel RK, Banerjee RS, Acharya SB. Antiulcerogenic and antiinflammatory studies with shilajit. J Ethnopharmacol 1990;29:95-103. Shakurov AS. Effect of "mumie" on bone regeneration and blood alkaline phosphatase in experimental fractures of the tubular bones. Ortop Travmatol Protez 1965;26:24-7. Kel'ginbaev NS, Sorokina VA, Stefanidu AG, Ismailova VN. Treatment of long tubular bone fractures with Mumie Assil preparations in experiments and clinical conditions. Eksp Khir Anesteziol 1973;18:31-5. Mirza MA, Alam MN, Faiyazuddin M, Mahmood D, Bairwa R, Mustafa G. Shilajit: An ancient panacea. Int J Curr Pharmaceut Rev Res 2010;1:2-11. Garedewa A, Feist M, Schmolz E, Lamprecht I. Thermal analysis of mumiyo, the legendary folk remedy from the Himalaya region. Thermochim Acta 2004;417:301-9. Aiello A, Fattorusso E, Menna M, Vitalone R, Schröder HC, Müller WE. Mumijo traditional medicine: Fossil deposits from antarctica (chemical composition and beneficial bioactivity). Evid Based Complement Alternat Med 2011;2011:738131. Ghosal SL, Jaiswal AK, Bhattacharya SK. Effects of Shilajit and its active constituents on learning and memory in rats. Phytother Res 1993;7:29-34. Spassov V. Memory effects of the natural product Mumyo on the water maze in rats. Eur Neuropsychopharmacol 1994;4:396. Bhattacharya SK, Sen AP, Ghosal S. Effects of shilajit on biogenic free radicals. Phytother Res 1995;9:56-9. Agarwal SP, Khanna R, Karmarkar R, Anwer MK, Khar RK. Shilajit: A review. Phytother Res 2007;21:401-5. Bhattacharya SK, Ghosal S. Effect of Shilajit on rat brain monoamines. Phytother Res 1992;6:163-4. Phaechamud TJC, Wetwitayaklung P, Limmatvapirat C, Srichan T. Some biological activities and safety of mineral pitch (mumijo). Silpakorn Univ Sci Technol J 2008;2:7-17. Takagi K, Okabe S, Saziki R. A new method for the production of chronic gastric ulcer in rats and the effect of several drugs on its healing. Jpn J Pharmacol 1969;19:418-26. Nabavizadeh Rafsanjani F, Vahedian J. The effect of insulin-dependent diabetes mellitus on basal and distention-induced acid and pepsin secretion in rat. Diabetes Res Clin Pract 2004;66:1-6. Canoru A, Üek R, Atamer A, Dursun M, Turgut C, Nelu EG, et al. Protective effects of vitamin E selenium and allopurinol against stress-induced ulcer formation in rats. Turk J Med Sci 2001;31:199-203. Rajic A, Akihisa T, Ukiya M, Yasukawa K, Sandeman RM, Chandler DS, et al. Inhibition of trypsin and chymotrypsin by anti-inflammatory triterpenoids from Compositae flowers. Planta Med 2001;67:599-604. Talbert R. Shilajit; a materia medica monograph. A Paper Submitted in Partial Fulfillment of the Requirements for the Degree of California College of Ayurveda, Grass Valley, California; 2004. Tiwari P, Ramarao P, Ghosal S. Effects of Shilajit on the development of tolerance to morphine in mice. Phytother Res 2001;15:177-9. Schepetkin IA, Khlebnikov AI, Kwon BS. Medical drugs from humus matter: Focus on mumie. Drug Dev Res 2002;57:140-59. Hahm KB, Park IS, Kim YS, Kim JH, Cho SW, Lee SI, et al. Role of rebamipide on induction of heat-shock proteins and protection against reactive oxygen metabolite-mediated cell damage in cultured gastric mucosal cells. Free Radic Biol Med 1997;22:711-6. Czinner E, Hagymási K, Blázovics A, Kéry A, Szoke E, Lemberkovics E. The in vitro effect of Helichrysi flos on microsomal lipid peroxidation. J Ethnopharmacol 2001;77:31-5. Ghosal S. Chemistry of shilajit, an immunomodulatory ayurvedic rasayan. Pure Appl Chem (IUPAC) 1990;62:1285-8. Ghosal S, Lal J, Singh SK, Dasgupta G, Bhaduri J, Mukhopadhyay M, et al. Mast cell protecting effects of shilajit and its constituents. Phytother Res 1989;3:249-52. Frawley D, Lad V. The Yoga of Herbs: An Ayurvedic Guide to Herbal Medicine. 2 nd ed. Delhi: Motilal Banarsidass; 2004. p. 265. Shakirov DS. Experimental treatment of infected wounds with mumie asil. Eksp Khir Anesteziol 1969;14:36-9. 2 Do acid suppressive drugs (pantoprazole and ranitidine) attenuate the protective effect of alendronate in estrogen-deficient osteoporotic rats?